See the Times-Tribune link for an interesting effort to explain a very obscure rule regarding rain delays and a home field disadvantage. Two very nice wins over the SWB RailRiders. Last night saw Alex Colome as less a strikeout pitcher and bit more crafty. But it was a brutal, 45° night and certainly not a lot of fun except for the win, Charlie Montoyo’s 500th as the Bulls manager. 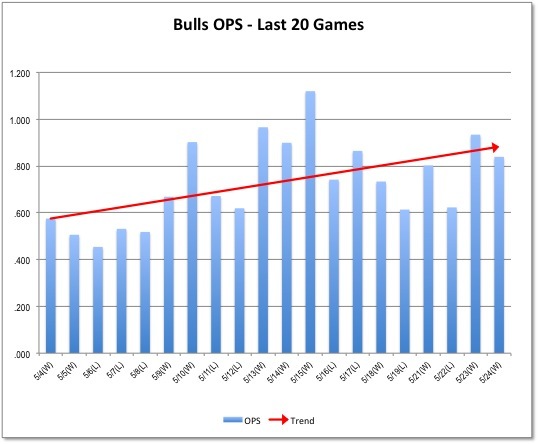 Bulls hitting has been superb in these Pennsylvania games. The team OPS was .934 and .839 for the two games, with notable home runs from Shelley Duncan and Wil Myers on Thursday and a bunch of doubles from almost everyone else. Especially to be noticed is Juan Apodaca’s shattering of the Mendoza line over the last two games. The relatively new catcher was 2 for 4 Thursday and 2 for 3 (with a hbp and 2 RBI) last night, pushing his average up to .216. See the chart for recent interesting trends. No, the Johnson/Wade matchup has not occurred yet, but watch this space. Check out the write up at the wrap link. Nice, concise description of Charlie’s work. When Mike Montgomery came off the DL, relief pitcher Austin Hubbard was sent to the Montgomery Biscuits. Never heard of Hubbard? He joined the Bulls from the Single-A Charlotte Stone Crabs while the Bulls were in Rochester, pitched ⅔ of an inning on May 17, and went on to Montgomery a few days later without getting in another game. Unless he comes back, he's a lock for this year's Moonlight Graham Award for pitchers. The Bulls have won 11 of their last 12 games and have a very nice upward trend in their hitting. I had looked up the rainout rules last week when it effected us, so no real surprise on this one, but it is a bit unbalanced perhaps. I thought Moonlight Graham had to play in Durham in your most recent rule set? Well, I certainly put that on the table. But then it just seemed to me that since they'd put the uniform on they deserved the award. So neither of last year's winners were ever in Durham. Hubbard's going to be hard to beat this year.